3D Cut+ allows you to remove medium to heavy imperfections with ease! 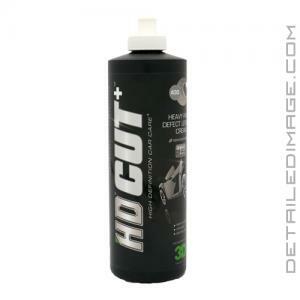 This non-diminishing formula (formally known as HD Cut +) is 100% body shop safe and contains no wax, fillers or silicone. You will only find specially engineered nano-abrasives and lubricating agents in this formula. These high-quality ingredients allow this compound to quickly remove heavy imperfections with a long work time while leaving behind less haze and finishes down extremely well. This means less compounding haze, increasing clarity and reducing the polishing steps needed to finish the paint down. If you do find yourself needing another polishing step, the 3D Polish+ is a great choice. Don't let imperfections keep your paint looking dull, use the 3D Cut+ to remove them once and for all! HD CUT is an advanced compound cream designed to quickly level scratches from fresh or cured paint. Body Shop sage and contains no wax or fillers. Use HD Cut with your choice of Rotary, Dual Action or Forced Rotation correction machines via wool or foam cutting pad. Specially engineered NANO - abrasives & lubricating agents make defect correction and surface removal extremely easy. Shake Well Before Use. Select a cutting pad and apply 6-8 pea sized drops to the pad and work on a 2' by 2' area. After each pass, clean pad with compressed air or a cleaning tool. Follow up with 3-4 pea sized drops and repeat as necessary. Speed on Optimal Rotary Buffer: 1000-1800 RPM. On a DA Orbital: 6000 OPM. Use moderate and firm pressure, let the machine, cutting pad and HD CUT do all the hard work. Make several slow overlapping passes until desired results are obtained. Wipe excess using a clean dry micro fiber towel.